I have been a huge fan of The X-Files since my dad & I first watched it for my 14th birthday on February 8, 1998. I’ll never forget my first X-Files experience. The episode was “Chinga,” written by Stephen King. I was hooked immediately. I went on a quest to watch all of the episodes I had missed from the previous four seasons, taking the VHS tapes out of the library and catching up with it in syndication on FX. Anyone remember when FX used to have their big X-Files marathons for Thanksgiving? I LOVED THOSE. Seriously, I read behind-the-scene books and delved into Internet forums (this was 1998-1999, so it was way back in the beginning stages of Internet fandom). I even created a big binder that had the plot of every X-Files episode printed out along with trivia about each episode and season. My grandpa helped me make that. I think I still have it somewhere and will have to take a picture of it. Anyway, I seriously loved The X-Files. I bet I could still pull up random trivia and episode knowledge. I probably could still name an episode title for seasons 1-5 if you described it to me. I had a poster in my room growing up. I made Top 10 lists of my favorite episodes for no one to see but me! So yeah, I love me some Mulder and Scully. I always knew we’d get more X-Files, but I figured it’d be another movie. I am so excited for another season. I just have to find time to do a rewatch. Man, this is seriously awesome news. Who else is excited for more Mulder, Scully, and Skinner in their lives?! 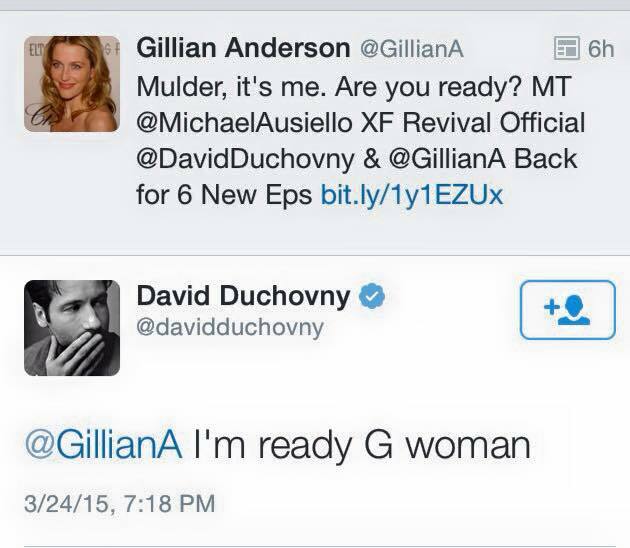 This entry was posted in TV and tagged David Duchovny, Gillian Anderson, The X-Files. Bookmark the permalink.